Region: Western part of Mongolia. Every year during the first week of October, the “Eagle festival” is celebrated in Bayan Ulgii, in the far west of Mongolia. The aimag of Bayan Ulgii is situated in the breathtaking scenery of the Altai mountain range, where four Asian countries meet. The inhabitants of this area with its rich mix of cultures are mostly ethnic Kazakhs wearing their traditional embroidered clothes. The “Eagle festival” is a tournament of falconers from the region, who hunt with trained eagles. Once a year, they come together from their home village to measure their skills. There are about 380 falconers organized in an association. They are of all ages, from the teenage boy to the octogenarian, but in keeping with tradition, no girls or women may practice the art. We will star city tour the first stop is Sukhbaatar Square, the central square named after the revolutionary hero of 1921 Damdiny Sukhbaatar who declared independence from China. We visit Gandan Monastery the largest and most famous functioning monastery in Mongolia; here we may experience monks in worship and see the impressive Golden Buddha Statue of Migjid Janraisig. Time permitting Natural History Museum which is famous for its authentic dinosaur skeletons and visit Zaisan memorial hill to view of whole city from there. 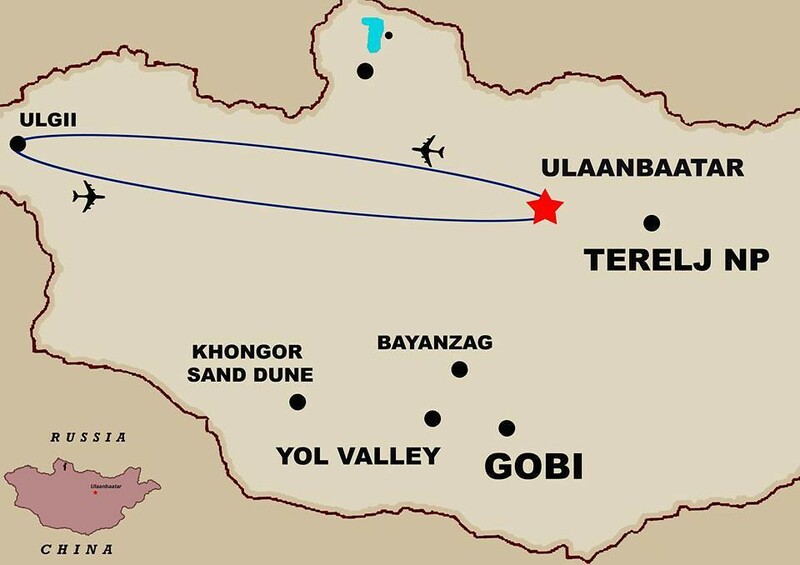 Transfer to the airport for a morning flight to Ulgii (2.5 hours), capital of Bayan- Ulgii, Mongolia’s westernmost province. 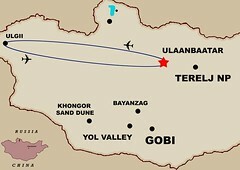 If the time permits, we will visit Ulgii town to explore local market. Ulgii (or Ölgii) is the capital of the Bayan-Ölgii Aimag (province) located in the extreme west of the country. It has an altitude of about 5,600 feet and population of about 29,000. It is the largest town in the area. It is the center of the predominately Kazakh region of Mongolia. The isolation of the Altai Mountains has preserved the language and traditions of the Kazakhs, wholive amongst some of the most spectacular scenery in Mongolia. We will visit Kazakh families in their settlement. Their Gers are slightly larger than Mongolian Gers, and are decorated with brightly colored rugs. We will enjoy their hospitality and friendliness and learn more in deep about their culture. You will see their traditional technology to make colorful rug. A visit to the well regarded provincial museum should provide a good overview of the Muslim culture of Western Mongolia that differs so much from most of Mongolia. The official opening ceremony commences with the participants parading in on horseback with their eagles. The competition begins with each Kazakh displaying his hunting outfit and accessories, the most elaborate and beautiful of which receive the highest points. In the afternoon, the judges will evaluate the Golden Eagles’ speed and agility. The eagles will be released from a cliff with their owners standing below, signaling for the eagles to land upon their arms as they do while hunting. Those with the fastest times and best technique will be awarded the highest scores. In the evening, attend a Kazakh play in honor of the hunters and their eagles. The Golden Eagles will be released from a cliff to attack fox skins that will be dragged by their owner on horseback. The eagles will be judged on their success of grabbing the "fox", their speed, and "gripping" technique. As the points for the competitions are being tallied, the Kazakhs will compete in their traditional game called "kukbar"- passing goat skin which tests one's horse riding skills, strength and agility. In the late afternoon, the winners of the festival will be announced at the awards ceremony. In the evening, enjoy a celebration dinner. We will be visiting some of the nomads of the area and experiencing their unique lifestyle. Kazakh craftswomen are renowned for their colorful embroidery and textiles, and their gers are beautifully decorated. Handcrafted felt carpets line the floor, and delicately embroidered tapestries adorn the walls of their homes, with each design unique to a particular family. After meeting a Kazakh, you will be impressed by the generous hospitality expressed through expansive meals with many dishes and countless cups of milk tea and sweets. The herder will also demonstrate his horsemanship and training techniques which have been passed down from generation to generation. Following an early morning breakfast, you will be transferred back to the Ulgii Airport. We bid farewell to our drivers and fly to Ulaanbaatar where we meet our local transport for a 90-minute drive to Hustai National Park, which is world famous for the successful reintroduction of the Przewalski horse, called "takhi" by Mongolians. It became extinct in the wild in 1969 and, since 1992, has been successfully reintroduced to Hustai from zoos around the world. This has been an international effort monitored by The Foundation for the Przewalski horse, based in the Netherlands and MACNE (Mongolian Association for Conservation of Nature and the Environment). Upon arrival in Hustai, you will check in at our ger camp. After lunch, you will take a jeep ride into the park. The national park is comprised of rolling Steppe Mountains with rather large patches of birch and aspen forests. There are also visible remains of Neolithic graves. In addition, red deer and wolf have increased quite a bit during the last few years, as well as Mongolian gazelle. Species present in Hustai but usually not seen include Lynx, Argali Sheep and Roe Deer. Usually, you are able to see the herds of wild horses grazing in the grasslands of the parks and other wild animals. After breakfast, we will return to Ulaanbaatar. In the afternoon there is more to see here upon arrival if you are interested, such as a visit to the Bogd Khan Winter Palace Museum, a residence of Bodg Jabzan Damba Hutagt VIII whom was Mongolia's last theocrat. Or take a leisurely stroll through the town center. In the evening perhaps you can enjoy a farewell dinner and attend the local folklore dance shows. Check out from hotel and transfer to Chinggis Khaan International airport or Ulaanbaatar train station for departure.